Click here to view and share your 2019 event photo. Click here to view and share your 2018 event photo. Click here to view and share your 2017 event photo. Click here to view and share your photo from the 2016 red card gallery. Click here to view and share your photo from the 2016 Photo Booth backdrop. 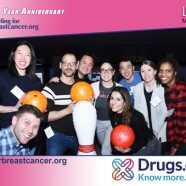 Facebook, SalesForce.com, Google, AOL, Yahoo!, NBC, CBS, Fox, Discovery Networks, Lifetime TV, National Geographic, Comcast, Hallmark Channel, Wall Street Journal, New York Times, PlaceIQ, Forbes, Hearst Magazines, Meredith Women’s Network, and Time Inc. were all bowling to help fight breast cancer and support breastcancer.org. The popular party took place Wednesday, March 16, from 6PM to 10PM. On the Spot Photos, is a professional event photography and on location event photo activation marketing company based in Saratoga Springs, NY. Click here for more information on our national event photography service. Check out the Albany Making Strides for Cancer event photos.